The Wheelhouse is a family–run beachside guest house providing bed and breakfast accommodation. We are in the perfect location – right on the sands of Porthcressa Beach, around the corner from places to eat, drink and shop, and a short stroll from the quay. The Wheelhouse has evolved over the years into a highly desirable place to stay. We are inspected annually by VisitEngland and have been awarded 4 stars and Silver & Breakfast awards. The Wheelhouse has many regular returning guests, a testament to our excellent reputation. We are always delighted to welcome our guests, both the first timers and all of the familiar faces. Choose from our nine guest rooms, all of which are well appointed, comfortable and furnished to a high standard. We have a mix of single, double and twin rooms, some on the ground floor, and most with superb sea views. All of our rooms are, of course, en-suite. From our breakfast room you can almost touch the beach! 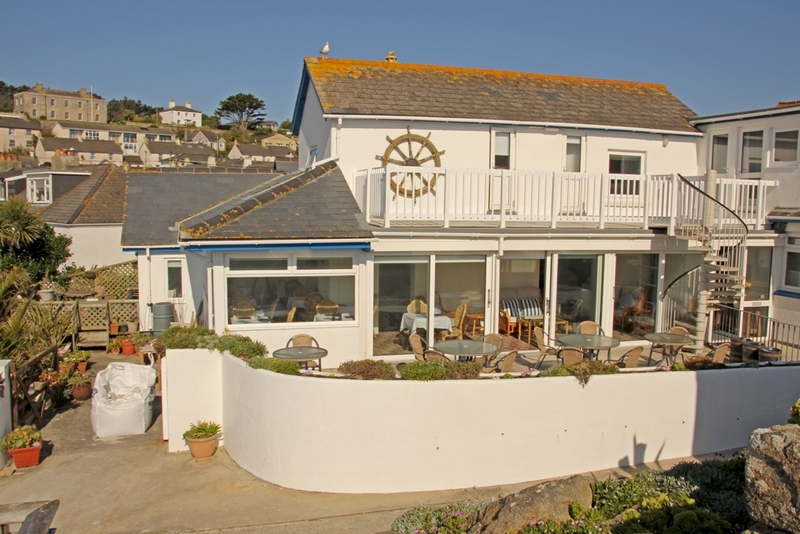 Enjoy a fabulous freshly cooked breakfast whilst taking in the breathtaking uninterrupted views of Porthcressa Bay. Whichever room you stay in you have access to our spacious lounge, garden and terrace, all of which have spectacular sea views. Perfect for relaxing and letting mainland stresses slide away. The Wheelhouse is a great holiday B&B. Our stunning beachside location makes it easy to completely unwind.